My husband has a favorite misspelling story from his business life that has to do with the word “public.” Leave out the “l,” and you’re left with what is perhaps the most feared of all misspellings. I fell victim to that same horror once too, but fortunately for my career, I caught it before it went, um, public. This was before the days of spell check, but spell check wouldn’t have caught the misspelling anyway. One little letter in the wrong place (or a missing letter) can make a big difference. That’s why people who do what I do (copyediting and proofreading) are still employed, despite the wonders of technology. What does misspelling have to do with the image above? Oh, I can’t wait to tell you. It concerns the most famous cake decorating company in the U.S., or perhaps the world: Wilton. Not too long ago, they advertised a cute new decoration on their Facebook page, with a link to their website. The lavender, flower-shaped decorations were supposed to be labeled “Purple Posies,” but apparently Wilton’s proofreader was on vacation that day, because somebody transposed a couple of letters. All the Purple Posies became Purple Poises. 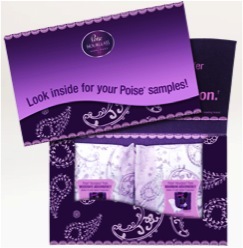 In case you haven’t been listening to TV ads, “Poise” is a brand of adult incontinence product. As soon as I saw Wilton’s unfortunate misspelling, I posted a slightly sarcastic response on Facebook pointing it out (something like, “That’s the last thing I’d want on my cake”). Then I waited a couple of days, thinking surely such an awkward error would quickly be corrected. I sent Wilton an email. And waited. Then I sent another. Then I posted again, this time directly on Wilton’s website. Finally, whether simply because I was persistent or perhaps because others were laughing as hard as I was, Wilton cleaned up its act and disposed of the Poises. You can see for yourself at http://www.wilton.com/store/site/product.cfm?id=6AB427D4-1E0B-C910-EA686AC181DA22F9&killnav=1. By sheer coincidence, I saw an ad today for a new product, the one shown above—a purple Poise. Oh dear, it’s too funny. Please don’t depend on spell check for important documents. Depend on a pair of trained human eyes with a brain behind them. Like me.